In this Zhiyun Smooth 4 review, I will go in-depth about all the features of this gimbal and I will provide as much information as possible in order to help you with your buying decision. I will also provide a tutorial that covers most of the functionalities and I will go over the Settings in detail. 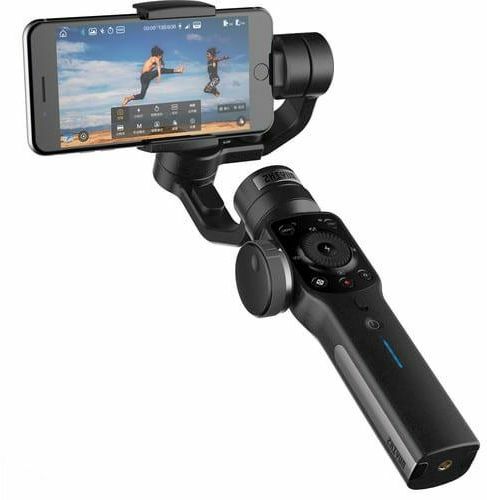 The Zhiyun Smooth 4 is 3-axis handheld gimbal from Zhiyun Tech that is basically more of a smartphone gimbal. 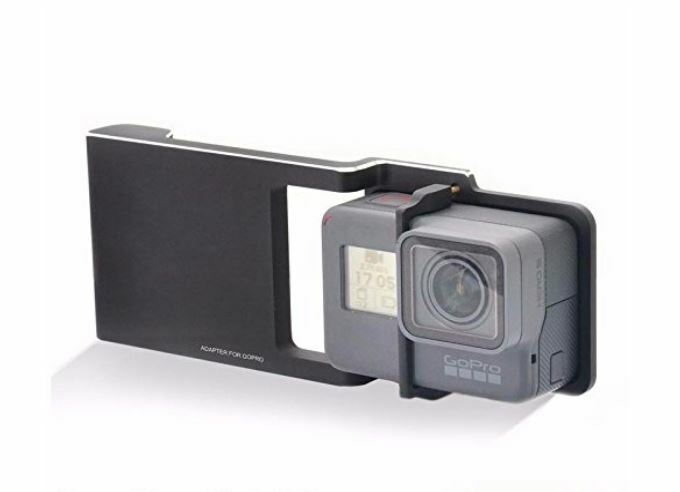 BUT it is not only for smartphones, it unofficially supports the use of a GoPro without the need of an adapter. I will discuss about this later and explain how to mount a GoPro on the Smooth 4. 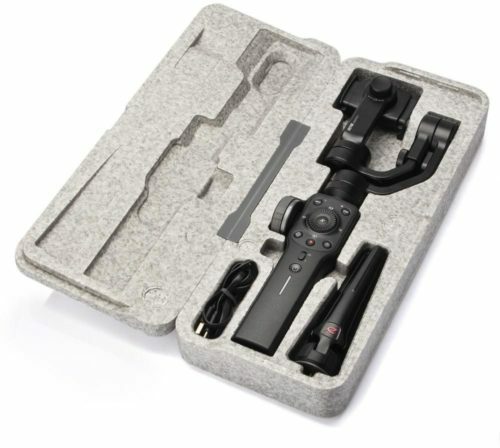 Let me start with what comes in the box and I will jump straight into the amazing features, this gimbal has to offer. How Does it Compare with the Smooth Q? As you may know, the Smooth Q is the predecessor of the Smooth 4. The Q was a very good gimbal however the 4 is easier to use and has some improved functionalities. Check my detailed comparison of these two gimbals here. The box feels like it’s made from styrofoam, very well made box to be honest. There is a USB-C cable for charging the gimbal and there is a small tripod that comes along. Then we have the gimbal which might look a bit bulky from the first look. The nice part is the handle which gives a firm grip. For its size, it feels light weight. But that won’t affect the quality in any way and we will see why later in this review. You will notice the control panel where the buttons are on the front of the gimbal, I will go through these in details later in the article. This gimbal can support most of the phones, GoPro cameras and other action cameras using an adapter. The holder is universal so you don’t have to worry about the size. Once the phone or camera is placed into the holder, you can check to see if it is balancing horizontally. If it’s falling to one side, you can loosen the screw in the back then pull up the arm slightly until the phone is balanced. As I mentioned earlier, a GoPro can be mounted directly to the Zhiyun Smooth 4 without any kind of adapter, unlike the other smartphone gimbals. So to mount the GoPro, we need to put the gimbal’s mount in Portrait mode, you need to achieve this using the nob at the back of the mount. Slide the GoPro in the mount by pulling the outer side of the mount, the GoPro should now be balanced. I used my GoPro Hero 6 Black with it and it fitted nicely, just make sure it’s well-balanced to avoid any shaky footage later on. If you prefer to use an adapter, then it’s up to you. Here’s a good compatible adapter from HolaFoto. Note that the gimbal’s buttons can’t be used with the GoPro camera, but only with a smartphone. 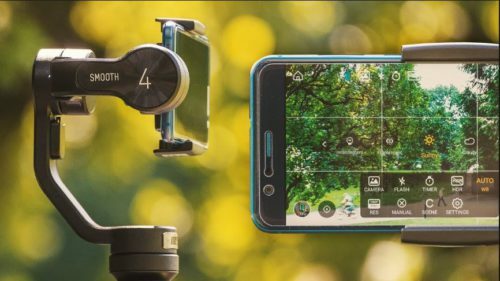 You will be using your phone’s camera with the ZY Play app from Zhiyun that let’s you control all the advanced options from the gimbal’s buttons control panel without touching the camera or phone. Download ZY Play for IOS phones. Download ZY Play for Android phones. To connect the gimbal to the phone, open the ZY Play app and connect it to the phone via Bluetooth (just make sure your phone’s Bluetooth is ON). Tap on Connect Device and it will bring a list of available devices. It will automatically detect the ones in range and of course if our case it is the Zhiyun Smooth 4. Tap on it and it will connect and launch the camera. The battery status of the phone and the battery status of the gimbal on the top right corner. On the left corner, we have the Home button which will take us out of the camera. Next to it, there is the Bluetooth icon which is turned Blue when you are connected. Then the picture, video mode, timer mode, HDR mode. On the bottom left corner, we have this icon which will take us to media library of the app. Next to that, we have object tracking which is usually turned off, I will talk about it in more detail later on. In the bottom center, there is the camera’s numbers displayed like ISO, White Balance, Exposure, etc. In the bottom right corner, there are the filters. You can’t control the features once your phone is connected to the gimbal. But that shouldn’t be an issue since everything can be controlled via the gimbal’s buttons. So, the first button is the Menu button which will bring up the main menu that contains the Settings, Features and Modes. To select any feature, you can press the centre button using the Flash button and to go back you can press the Menu button. The Display button which toggles the display number on the screen On and Off. The wheel has many functions, it can be used to navigate in between options by rotating it clockwise or anti-clockwise. It also has 4 buttons on each side for different settings. The top button brings different resolutions and frame rates for video recording and of course it can only support the phone’s resolutions. You can also use the wheel to scroll through these resolutions and press the Flash button to select one, it acts as the Enter command. If you press and hold the Flash button, it will turn on the flash on the phone. The right button makes it enter the exposure compensation mode and you can use the wheel to increase and decrease the exposure. The left button, toggles between the front and back camera. And the down button brings out the photos and videos you have taken with the app. The big wheel on the left side is used to zoom in and out of the scene and if you press the Target button, the wheel can be used to change the Focus of the scene. To take a photo, you can press the camera button and to record videos, the Record button. Below the Record button, there is a small switch to toggle between Pan Follow and Lock Mode. In the Pan Follow mode, the phone will pan side ways when you turn the gimbal but not up and down. It is good for times when you want to follow an object that is moving around you but you don’t want to point the phone up and down. In Lock mode, the phone will stay in one position and not move no matter where you turn the gimbal’s handle. This is perfect if you want to keep the phone in one direction and if the shot requires you panning the phone up or down or sideways but not tilting the phone. On the back, there is another Toggle switch. When you press it down, it enters the full Follow mode which means that whichever direction you turn the gimbal to, the phone will pan in that direction including titling the phone up and down. The upper part of the switch activates the phone Go mode, the motor will stiffen up and now the phone will move in any direction you point the gimbal to. This is great when you want to move the phone between objects quickly or you want to create a neat transition in your video. Below the Power button, there is the LED that indicates the battery status of the gimbal and will outlast your phones battery. It can last up to 12 hours. Camera: Check the next section below where I will talk about it in detail. Flash: Toggle phones’ flash on and off. Timer: To set a timer for taking a photos. Manual: To control the camera settings manually including Shutter speed, ISO, White Balance, etc.. Scene: To select Walking or Motion. If you will record a video while walking slowly then select Walking and if you are running or moving fast then select Motion. Filters: To apply different filters to the scene. Settings: Camera Tab: To change basic settings like zoom sensitivity, image stabilization, etc..General Tab: It has all basic information of the device like the name and version. Now going back to the Camera settings, the first one is 180 degrees panaroma, if selected you will see the 180 panorama icon on the top left of the screen. The Panorama mode is great for taking scenery shots while using the Smooth 4 with the tripod. The gimbal will take 9 photos in total (3 facing straight, 3 facing down and 3 facing up) and will stitch them together to make one big photo. Tip: all these features work best when the gimbal is set on a tripod and not handheld. This is for achieving that blurred effects for moving objects. When you turn this on, you press the Photo button once and you will notice that everything is leaving a blur in the scene. What you have to do is press the Photo button again and it will snap a shot. This is best suitable for dark scenes. Press the Photo button once and you can can see any moving light will leave a continuous trail. You can leave it for as much time as you like and then press the photo button again to snap a shot. That’s nice for shooting roads at night! You might notice that quality decreases while using long exposure compared to normal modes. This only works if your phone can record in slow motion. To shoot in slow motion, you press the Photo button and not the Video button. The standard the time-lapse your phone has but here you can control it a little more. Once you press Enter, it will take you to the next window where you can set the interval and duration. This is really a neat feature and this is where the gimbal will move the phone slowly from one point to another while recording a time-lapse video. You need to move the phone manually to the start position and press the Enter button once then move it to the end position and press the Enter button again. Below that, there are more options like Auto-focus Lock which can be turned on so the camera doesn’t lose focus during the recording. If you press Next, you will be able to select the interval and duration. Tip: This mode can take multiple waypoints and not only two waypoints. This is one of the coolest features that I like. It can be done manually but the Smooth 4 will do it for you. You will need to add a waypoint. Select a starting point and zoom in to your object and take a picture. Next, you will need to go full zoom out and press Enter to select the second waypoint. Then select the Time needed from full zoom to full wide. You have to physically move towards your object while keeping it centered. The Zhiyun Smooth 4 is a nice multi-purpose stabilizer and it’s loaded with awesome features. It is a gadget helpful for both amateurs and professionals. It can be used with both smartphone and GoPro unless you’re only willing to use a GoPro then you might want to look at other models more GoPro-friendly like the Feiyu Tech G6 gimbal. I had some bugs along the way like some times the buttons where unresponsive so I had to turn the app off and on. But all in all, the build quality is good, the app is comprehensive, the battery life is great and the price is very reasonable.